Advice: Medium Risk, High Gain stock at attractive entry point. Buy systematically. Adani’s Mundra Port is the #1 private and #4 overall port in India. Growth has been rapid, with Sales up by 32%, Profits 53% and EPS 49% CAGR over 5 years. Debt Equity is 1.18 times. The recent $2b acquisition of Abbot Point Port Australia will double the scope of operations. While uncertainty exists about the viability and returns from this, it facilitates coal imports into India, demand for which is expected to soar. A recent dip in price makes valuations attractive. Investors can hold on and even look at this fall as an opportunity to invest. Adani Port and SEZ (APSEZ), formerly Mundra, is a Gujarat based firm with FY12 revenues of 2500cr and PAT 1177cr (standalone). Consolidated revenue is 3209cr. Promoted by Adani Group, its businesses include Mundra, India’s largest private port with volumes of 64 MT (FY12), several Ports operating contracts, Australian operations and an SEZ area adjacent to the port, which is being developed on an area around 18,000 acres. Market share of APSEZ increased to 16.4% (FY12) from 14%. APSEZ trades in a broad range of products, implying lower business risks. Fig 1. It is # 4 among all Indian ports, and #1 in terms of private ports in India. Being a private port, APSEZ is free to price its services, unlike PSU ports in India. It has ‘take or pay’ arrangements with many of the customers. This protects APSEZ from sudden drops in demand. Connectivity and logistical facilities connect the Port, berthing and storage facilities to Roads, Rail, Airstrip and Pipelines for goods transportation. The port has added a specialized passenger car exporting facility. A Power plant being set up by Adani group will cater to internal demand. The SEZ facility enjoys a series of Indirect and Direct Tax benefits designed to encourage industrialization by the Gujarat Government. The Shareholding pattern is Promoter group 77.5%, MFs/ DII 4.9%, FIIs 10.2%, Individuals retail & HNI 3.7% and Bodies Corporate + others 3.7%. It’s good that Promoter holding is high. But as per delisting norms, they may need to reduce to 75% in the next year or so. Adani group has cross-holdings in Adani Power, Adani Enterprises and APSEZ. The SEZ area is organized into clusters to cater to different Industrial groups. The port has rapidly increased business throughput over the last 5 years, venturing into new categories of goods, and working closely with importers and exporters to improve infrastructure. Over the last 5 years growth has been rapid, with Sales by 32%, Profits 53% and EPS 49% CAGR. The margins have been steady, see Fig 3 – Operating Margins (70%) and PAT Margins (50%). APSEZ and Adani group bought the Abbot Point coal terminal in May last year for $2 billion. It is synergistic with Adani’s purchase of Linc Energy’s Galilee coal project for $2.7bn in August 2010. The coal terminal, of capacity 50 MT a year, will facilitate the transport of coal from Australian mines to India. It is also developing ports at Hazira, Mormugao, Visakhapatnam and Kandla in India and Dudgeon Point in Australia, in terms of terminal creation or port operator. Vision – to increase the annual cargo handling capacity to 200 MMT by 2020. Seaports are critical to India’s growth and development, as over 80% of imports/ exports have to take this route. The 6-9% GDP growth in India is now testing the capacities of Indian ports. Also govt. ports so far have been unable to scale up and expand much, due to vision and execution constraints. Major competition to APSEZ is from Kandla, JNPT and Pipavav on the Western shores. Mundra is able to provide port access to Gujarat, Maharashtra and North India based industry. Kandla, JNPT and other govt. ports have not invested sufficiently in infrastructure due to government constraints. Pipavav is at an early stage of development. 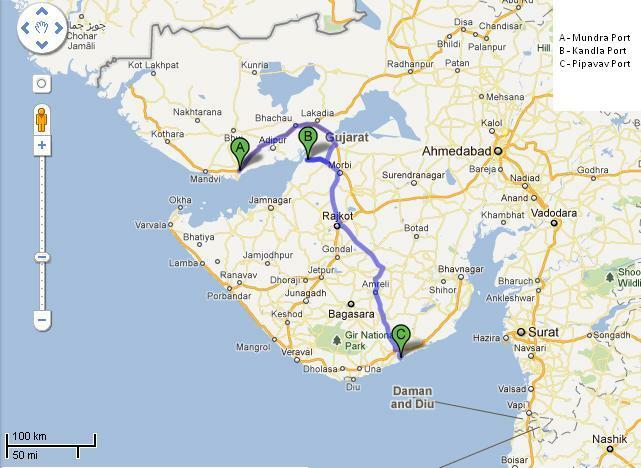 Also it is in South Gujarat and logistically more remote. Pipavav Port in Gujarat is owned by A.P. Moller-Maersk Group, is one of the largest container terminal operators in the world. Over the next few years, APM Terminals will transfer a lot of India business from other ports to Pipavav, and also build good infrastructure here. The IPO in Nov 2007 was very successful. It was oversubscribed 115 times, and provided listing gains. However it was aggressively priced. The share price has fallen from a post IPO high of 264 to a low of 50 in Nov 2008, a recent high of 185 in Oct 2010, to today’s 118. IPO investors have seen a 5% CAGR return in price in 5 years, see Fig 5. The Dividend too has increased steadily, till the current 50% – Re 1 on FV Rs 2. Debt-equity is 1.18 on Mar’12 (down from 2.7 at IPO time). This is good, for an infra company. For an infra company, cash is critical. APSEZ has improved Cash flow from operations at 44% and EPS (adjusted) 48% CAGR in recent years, see Fig 6. The PE range has been 20-50 times over the last 5 years. Current PE of 21 is at the low end of this range. Fig 8 plots the market price against the adjusted EPS over a 5-year period. EPS shows us a steady quarterly increase indicating stable business performance. APSEZ leads on Profitability, and Debt parameters. It also commands a premium Pricing. The Financial projections for APSEZ below are not inclusive of new acquisition of Abbot Point Port, about which we do not have sufficient detail. Falling exports: The Indian exports have been affected by the ban on Iron ore exports, changes in govt stance on agri exports and falling demand in Europe. APSEZ will be able to grow market share of exports, but depends on economic conditions to sustain volume growth. Imports are expected to be quite resilient, e.g. Coal. This may delay additional construction for the SEZ area. Central environmental clearances are notoriously difficult and get delayed. This is an unknown. The Abbot Point Port in Australia was acquired for $2 billion. While this has a good synergy with current operations, there is insufficient clarity on returns and funding /repayment schedule of loans. International business uncertainties, such as: 1) new taxes by Australian govt. on the profits of international companies engaged in mining operations in Australia and 2) and a fall in international Coal Prices that have fallen 21% since 1stJan 2012. These may not directly affect APSEZ. However the returns from Australian investments may be affected. Recent rumours against Adani Group were that it has powerful political linkages, and interests in illegal mining in Karnataka/ Andhra Pradesh. These rumors affected investor sentiment in Adani Industries. This could also affect APSEZ in the future. However APSEZ is a different business, and the possibilities of this are remote. APSEZ will capture market share due to good connectivity, spare capacity, better access and good facilities. The spare capacities with APSEZ will be rapidly commissioned in next few years. EPS may slow to 40-50% growth range over the next 3 years due to higher base effect. But this is also high. PE has fallen to very low and attractive levels, and combined with robust business performance makes this an attractive entry point. SEZ revenues are lumpy, driven by sale of land to industries. However the infrastructure provided and industrialization will drive this business. It is the nature of markets that sentiment makes share prices fall far below or appreciate far above the fundamental value. APSEZ is underpriced at these levels. In a falling interest rate scenario, APSEZ will continue to outperform as it lowers its cost of debt and delivers on projects. APSEZ is a Medium Risk, High Gain stock. At these levels and in this trajectory, it is a BUY. Our valuation prices the share at 147. Thus today it is available at a 25% discount.